What Type of Dangerous Goods Training is Needed in Australia? Dangerous goods are shipped across Australia on a daily basis. The fact that most of these goods reach their destination safely is in large part due to the dangerous goods training that has been mandated to insure the protection and the health of the workers handling these products, the public, and even the environment. Various types of dangerous goods training is needed to continue to ensure that the handling and shipping of these goods are done in a manner that protects everyone from the hazards these goods present. 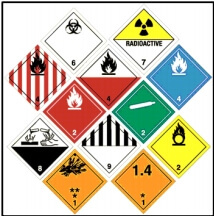 There are a variety of dangerous goods training programs for the handling of such goods. These training programs include the proper attire to wear when handling these goods, proper packaging in safe containers, the need for specific types of labelling to identify these goods as not only dangerous, but what type of goods are contained. The type of training needed for the handling of dangerous goods is going to be a mix between general training and safety procedures common to handling all dangerous goods and specific training as to the handling of specific types of dangerous materials. For example, the training required to handle explosive materials will be somewhat different than handling chemicals that could effect the respiratory system if mishandled. Dangerous goods training also needs to include the storage of dangerous materials. These materials needs to be stored somewhere both prior to shipping and after they arrive at their destination. This means that all persons who will be working in and around the storage facilities of these warehouses need to be trained in the proper handling and storage of these materials as well as emergency procedures so that they know what to do in the case of an emergency such as a leaky or damaged container. Specialized dangerous goods training is also needed for everyone involved in the transportation of any dangerous materials from the office staff, down to those who load the containers containing this material, to those who transport and deliver this material to it’s final destination. Not only is dangerous material training needed to safely transport these materials, but also training is needed to help those in the transport business recognize unmarked dangerous materials that they may be asked to transport without being advised that these materials are indeed dangerous. Training for dangerous goods shipped by air covers not only training to all airline personnel involved in the handling and shipping of these goods, but is also required for those who are shipping dangerous goods by air to ensure that these goods are properly handled, labelled and identified. Making sure that your business has the right type of dangerous goods training for the goods you are handling, storing, and transporting not only protects your company for high fines, work stoppages, and work hazards but also protects the public and the environment as well.